Private Jet Charter to Sardinia anyone? ~ Sardinia Baby! "hot food can be requested in advance, and the galley will usually have a microwave"
Private jet experts available 24 hours a day! Hotels are not included but at that price you should be able to sleep on the plane. Thinking of buying? 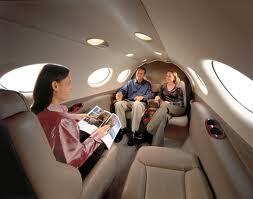 A Learjet 45 has 8 proper seats, a good WC, 4 hour range and strong performance. A 2001 aircraft with 4,500 hours will go for around $3m.